Tossed and turned most of the night but did get quite a bit of sleep in the end. Woke up to a knock on the door at 08h30 (I think they were checking who was in each compartment). Was a little nervous we'd get a new addition! Anyway, after that it we were awake and got up. Tried out the carriage toilets, which were still nice and clean although we've read some horror stories about the state of them in the visitor's book we found in our carriage! No showers on our train (found out much later that the first class carriages had them, but heard they weren't much use), so that'll be interesting. But I did manage to clean my face and brush my teeth in the little toilet compartment. Just after breakfast we stopped at Kirov (my first awake station stop), which means we've travelled almost 1000kms already! So far the scenery is all quite similar. Lots of thin spindley trees (birch apparently) or firs, dry long grass and occasional patches of snow. 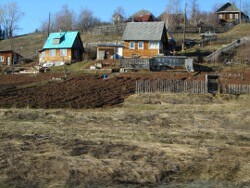 Some towns , all of which seem to have wooden houses (for the most part, Russia made me think of Swiss Alps :P). It has a strange feeling of dryness, but a cold dryness (unlike the hot dryness of a desert). After breakfast we lazed around in the cabin, alternately looking at the passing scenery or reading. I dozed off for about an hour. When there are so few options on what to do, one really has little choice but to truly succumb to relaxation. At 13h30 we stopped at Balyezino station. This was the first one we've stopped at long enough to get out and have a wander and browse the local stalls. Mostly they're selling chips, beer cigarettes and chocolate etc. But a few have eggs, bread and fish. And then it was back on the train. More reading, more watching the scenery go by. I will say that the Bryn Thomas book is ideal for this trip! Rat has the Lonely Planet one and it's apparently pretty useless unless you're getting off to explore the towns along the was. And considering this train runs weekly, I can't imagine why you would! Quite a few people on our carriage (which is 1 Norwegian guy, a recently-retired couple from the UK and a Mongolian girl ... and Rat & I) are getting off in Mongolia apparently. Unfortunately I didn't have the time, but I'm also not sure what there is to do there while you wait for the next train to Beijing. 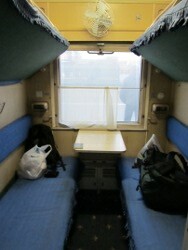 Just before 6pm we stopped at the Perm-2 station. Keep in mind the train stays on Moscow time until we get to Mongolia although, the towns we are passing thru now are 2hrs ahead, which makes it about 8pm local time. 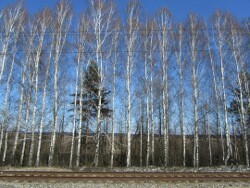 Perm was another get off and stroll the platform stop. But nothing really interesting to see and a few more permanent stalls selling the same old stuff. After Perm we decided it was time for dinner. The restaurant car was full compared to almost just us at breakfast. But, we weren't in a hurry and the waitress is such a sweet lady rushing around. I'll admit, I was nervous of the food on the train. But it turned out to be usually really good. Although, all the meals look fairly similar, regardless of what you order. For dinner, I had a chicken fillet with cheese, which was one of my fav meals of the train trip. It came with very nice potatoes, fresh tomatoes, peppers and salad and that purple pickled onion stuff, which was not bad at all! I ate it all (except the rogue mushrooms hiding under the cheese sauce!). Rat's pork and the people sitting opposite us's beef looked identical to what I got except with different meat. 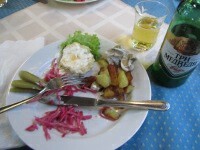 I do want to try the borscht and the pancakes with caviar too now :) I had a beer with dinner (for some reason I *only* drink beer in foreign countries!) called Tri Myedvedya. After dinner, I climbed into bed and finished reading my book.